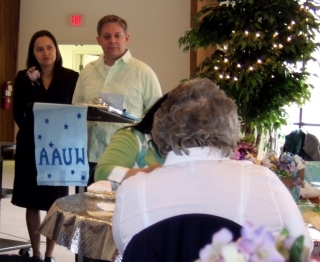 The Sandhills/Southern Pines Branch of the American Association of University Women honored Dr. Claudia Marin Restrepo and Byron Kelso with a wedding breakfast on March 15, 2008 in the Fellowship Hall of Our Saviour Lutheran Church in Southern Pines, North Carolina. Families of the bride and groom and the wedding party were present. Also present were guests from Austria, Canada, Colombia, Zurich, and New York. The wedding followed at 2:00 PM in Pinebluff Methodist Church. A reception was held at the home of Jane McPhaul afterwards. Dr. Restrepo, a recipient of a prestigious American Association of University Women International Fellowship, studied Public Health at the University of Alabama. Dr Restropo spoke to the group, in both English and Spanish, about her studies and experiences with her International AAUW fellowship and of her appreciation for this award. She is a native of Colombia, South America where she received her medical degree. She continues at the University of Alabama, now studying under a Fulbright Scholarship. Dr. Restrepo plans to return to Colombia to help women gain control over their reproductive lives. Of vital importance to her, is improving the welfare of Colombian children. Related story and picture published April 9, 2008, in the Southern Pines Pilot.